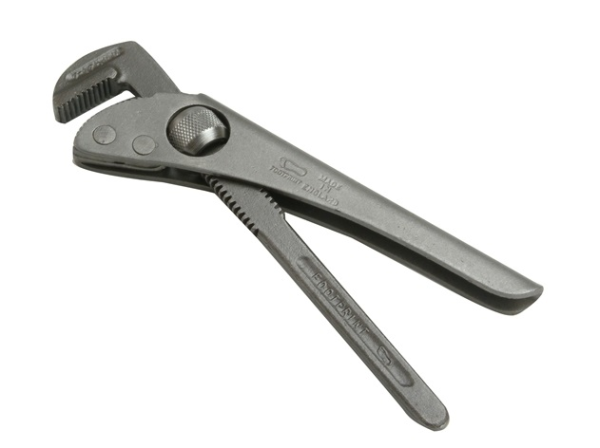 Footprint Pipe Wrenches are made from high quality Sheffield Steel and are of a traditional design. These adjustable pipe wrenches are used for turning soft iron pipes and fittings with a rounded surface. Their thumb-turn knurled nut allows for easy adjustment with one hand. The adjustable, induction hardened jaws allow for any forward pressure on the handle to pull the jaws tighter together, with the teeth angled in the direction of the turn to provide high grip. These pipe wrenches shouldn’t be used on hardened steel hex nuts or other such fittings as their head could be damaged. However if a hex nut or bolt is soft enough, that it becomes rounded beyond use with standard wrenches, then these they can be used to break the nut or bolt free. Available in either 9” (225mm) or 12” (300mm). Capacity of up to 48mm. Capacity of up to 60mm. Available in either 9” or 12”.